This chapter looks at an alliance of emerging economies (the BRICS countries) as a useful framework to study the media's role in justifying environmental policies in light of the IPCC report. It also looks at the usefulness of applying the BRICS concept to the contexts of economic growth and climate change. The climate strategies that are publicly discussed in the BRICS countries constitute the basis for future climate negotiations and geopolitical positioning. A key question then becomes: how does the media represent and justify existing and potential national climate policies with regard to the IPCC findings? To answer this question, the chapter considers two factors: the realities of the existing national media systems and the natural urge to minimize any threats to national economic growth. 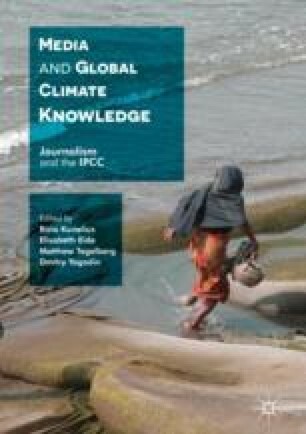 The empirical analysis focuses on media coverage of the IPCC reports (content analysis of the voices mentioned in the media texts and comparison of thematic representations across the selected countries). Clark, D. (2011). Which nations are most responsible for climate change? The Guardian, 21 April. Retrieved from http://www.theguardian.com/environment/2011/apr/21/countries-responsible-climate-change?